Mohammadkhani, S., Aghaziarati, M. (2010). Production of Iron Disulfide Nanoparticles by Hydrothermal Process. International Journal of Nanoscience and Nanotechnology, 6(4), 231-235. S. Mohammadkhani; M. Aghaziarati. "Production of Iron Disulfide Nanoparticles by Hydrothermal Process". 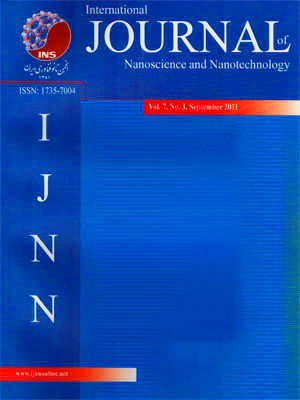 International Journal of Nanoscience and Nanotechnology, 6, 4, 2010, 231-235. Mohammadkhani, S., Aghaziarati, M. (2010). 'Production of Iron Disulfide Nanoparticles by Hydrothermal Process', International Journal of Nanoscience and Nanotechnology, 6(4), pp. 231-235. Mohammadkhani, S., Aghaziarati, M. Production of Iron Disulfide Nanoparticles by Hydrothermal Process. International Journal of Nanoscience and Nanotechnology, 2010; 6(4): 231-235. In this research, a single-stage low-temperature hydrothermal synthesis route was successfully developed for preparation of Iron Disulfide. The prepared powder was characterized by X-ray diffraction (XRD) and scanning electron microscopy (SEM). These analyses showed that nanoparticles were well crystallized, pyrite was the main product and the shape of crystals was nanorod. Also, the influences of reaction temperature and iron source on the formation of the target compound were investigated.